Donald Trump announces his decision that the US will withdraw from the Paris Climate Agreement. 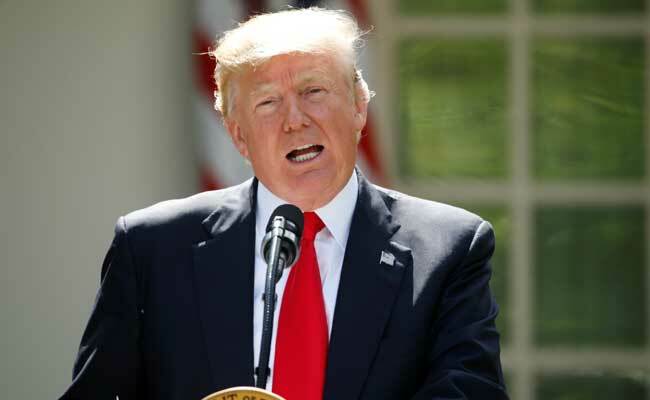 President Donald Trump announced Thursday afternoon that he is withdrawing the United States from the landmark Paris climate agreement, a move that honors a campaign promise but risks rupturing global alliances and disappointing both environmentalists and corporate titans. The U.S. exit from the climate pact could raise doubts about the commitment of the world’s largest economy to curbing global warming and make it more difficult to hold other nations to their environmental commitments. All but two countries – Nicaragua and Syria – signed onto the 2015 accord, which was a signature diplomatic achievement for President Barack Obama. Trump was preparing to make his decision official in remarks from the Rose Garden at the White House. The atmosphere was celebratory, with a military band performing “Summertime” and other jazz hits as Cabinet members, White House staffers, conservative activists and other Trump supporters took their seats in the garden under the warm sun. The Paris agreement has long divided the Trump administration, with the president taking much of the spring to make up his mind amid an intense campaign by both sides to influence his decision. Secretary of State Rex Tillerson and Ivanka Trump, the president’s daughter and adviser, are among those who urged him to stay in the deal, arguing it would be beneficial to the United States to remain part of negotiations and meetings surrounding the agreement as a matter of leverage and influence. White House chief strategist Stephen Bannon and Environmental Protection Agency Administrator Scott Pruitt pushed for a withdrawal, which probably can’t actually be finalized until near the end of Trump’s term. They, along with other hard-line conservatives, have sought to convince Trump that meeting the terms of the agreement would be harmful to the bottom lines of U.S. businesses and would jeopardize manufacturing jobs, especially in the Midwest and other regions where Trump found deep support in last year’s election. Introducing Trump at the Rose Garden, Vice President Pence said the climate decision was an example of the president putting what he sees as the interests of the United States above all else. Condemnations of Trump’s decision from environmental leaders as well as Democrats on Capitol Hill arrived quickly Thursday afternoon. More than 190 nations agreed to the accord in December 2015 in Paris, and 147 have since formally ratified or otherwise joined it, including the United States – representing more than 80 percent of the world’s greenhouse gas emissions. It’s also heavily backed by U.S. and global corporations, including oil giants Royal Dutch Shell, ExxonMobil and BP. Large corporations, especially those operating in international markets, have had years to get used to the idea that there are likely to be reductions on carbon emissions, and they have been adapting their businesses accordingly for some time. Withdrawing the United States from the agreement could take years due to the accord’s legal structure and language, but such a move would weaken its goals almost immediately. The United States is the world’s second-largest greenhouse gas emitter and would otherwise have accounted for 21 percent of the total emissions reductions achieved by the accord through 2030. The Paris agreement is designed to set the world on a path toward keeping the warming of the planet “well below” a 2 degrees Celsius (3.6 degrees Fahrenheit) rise above preindustrial temperatures, an amount of warming that scientists would consider “dangerous” climate change. Hans Joachim Schellnhuber, a physicist who founded the Potsdam Institute for Climate Impact Research in Germany, said that the United States departing from the deal could make the planet a few tenths of a degree Celsius warmer, based on the assumption that the world carries ahead with its plans while the United States keeps on emitting greenhouse gases as usual. But he emphasized that’s still a significant increase – especially if the goal is ultimately to hold the planet to an even more ambitious 1.5 degree Celsius, another target cited in the Paris agreement. Schellnhuber says he thinks that other countries would not follow the United States out of the accord, and instead are likely to keep on pushing to cut their emissions, meaning they may be able to offset the United States’ departure from the agreement. But the diplomatic repercussions of a U.S. withdrawal could be vast, as demonstrated when European leaders last week pushed Trump to stay in the climate deal at the G-7 meeting in Italy. Trump appeared unswayed, and a communique coming out of the meeting pointedly failed to include the United States among G-7 countries backing the agreement. Some environmentalists warned that pulling out of the deal will be disastrous.